Dunkin' Donuts Park, home of the Eastern League's Hartford Yard Goats, will be peanut-free in 2019 and beyond. 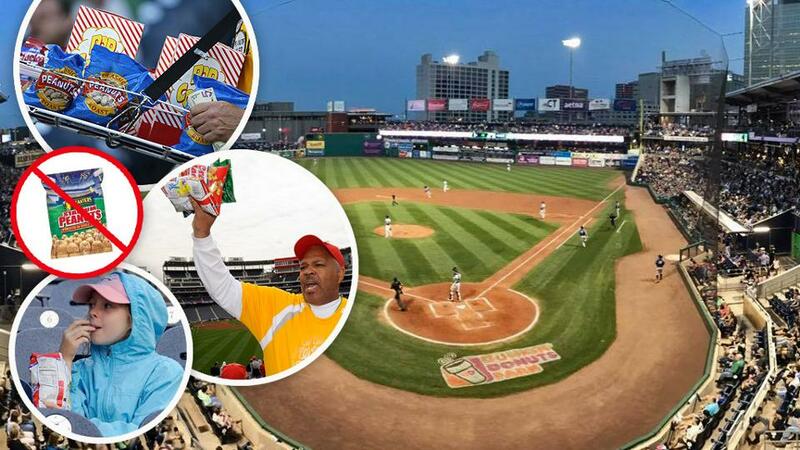 Fans attending games at the Hartford Yard Goats' home of Dunkin' Donuts Park have their choice of more than 200 concession items. In 2019 and beyond, however, peanuts and Cracker Jack won't be among them. The Yard Goats, Double-A affiliate of the Colorado Rockies, are the first professional sports team to ban all peanut products at the ballpark. They did so "in order to create a safe environment for individuals with peanut and tree allergies," noting that one in 13 children has a peanut allergy. Peanuts carry a greater risk than most allergens, in part because discarded shells cause both residual and airborne hazards. Ingestion can lead to anaphylactic shock, resulting in severe illness or even death. The Yard Goats' ban resulted in a strong reaction of a different kind. Peanuts and Cracker Jack (which contains peanuts) are inextricably linked with the live baseball experience, dating at least back to their lyrical inclusion in "Take Me Out to the Ball Game." While peanut allergy-afflicted individuals (and those who love them) flooded the team with praise, many derided the Yard Goats for what they felt was a major overreaction that punished the many at the expense of the few. "What's next?" went one representative criticism. "Do away with bread to please those with a gluten allergy? Do away with alcohol because you're worried alcoholics will drink it? Do away with cheese or ice cream because some are allergic to milk?" Yard Goats president Tim Restall and general manager Mike Abramson were expecting the peanut ban to elicit a considerable response. Nonetheless, they were caught off guard by the ensuing publicity. "We were expecting to make national news, confident we would, but this was more than we thought," said Abramson. "The interesting thing, which didn't occur to me, was that all of the debate was about what people perceive: the 'wussification' of the country. That this is not about peanuts, this is about coddling our children. It really elevated to that. Peanuts were the collateral damage of the whole thing." The team's decision, though, was more practical than philosophical or socio-political. "The Yard Goats chose health and safety over tradition," Restall said. "['Take Me Out to the Ballgame'] came about in 1908. It was written by two guys who had never been to a baseball game. In 1908, the coffee filter was invented, the first Model T came off the line, the first plane carrying a passenger took off. Tradition is important, but times have changed. Now there are kids that, if they come into contact with peanuts or peanut shells, they will die. It's very serious." The ban has its roots in a July 2018 meeting with Erin Cha and Kerry Adamowicz, Hartford-area sisters (and Yard Goats fans) who felt the team could do more to cater to those with food allergies. Four-year-old Brian, the youngest of Cha's four children, is severely allergic to a variety of foods (including peanuts). Adamowicz's children also suffer from various food allergies; her two 2-year-old son, Sam, is allergic to peanuts. "They were very responsive and open to having a conversation," Cha said of the team. "We had been to tons of games, and there were two things we noticed: it was impossible to buy food for people with a lot of allergies. We suggested maybe having prepackaged allergen-friendly snacks in the team store. The other thing is, peanut allergies are stressful. You have to wipe down the seats and the railings, and you never know who you'll be sitting next to. If the person behind you is eating peanuts, the shells go everywhere." After meeting with Cha and Adamowicz, Abramson and Restall began to brainstorm. "We've had peanut-free days and peanut-free sections, where we wiped down the seats and wiped down the fixtures," Restall said. "But then it became, 'What if we didn't sell peanuts at all?'" If that seems like a leap, it was a natural step for the Hartford front office. "Over the past few years, we've gotten confident enough to say, 'What is the boldest variation of this move we can make?'" Abramson explained. "Maybe we just don't get excited anymore unless we're doing something extreme." Restall acknowledged that peanuts were a strong-selling concession item, but he believes fans simply will buy something else instead. "If someone has to sacrifice peanuts at a ballgame so that a child or adult can come to a game, that's OK," he said. Two-year-old Sam (l) and 4-year-old Brian are Yard Goats fans with peanut allergies. "When [the Yard Goats] came back to my sister and I in the last month or two and told us they had decided to go peanut-free, we were completely blown away," Cha said. "We were so surprised that they made that choice. It removes so much stress and makes it much easier to go to a baseball game, which we love to do. ... Brian loves sports. He loves baseball. He had his birthday last year at the Yard Goats' stadium. We try to make every effort for him to do things like any normal kid would. "I've heard from so many parents who have been blown away. Like, crying blown away. When you have kids with food allergies, it gets frustrating having to change your life for it every day." Earlier this week, the Yard Goats ran a Facebook contest in which they asked fans to rewrite "Take Me Out to the Ball Game" by replacing "peanuts and Cracker Jack" with a different lyric. Four finalists will be announced soon; after a fan vote, the winning lyric will be sung during the seventh-inning stretch at Dunkin' Donuts Park. "It's a fun way to turn the corner on this conversation and it will lead to something that is unique about our park," Abramson said. For Cha, the change means taking her family out to the ballgame will be more enjoyable. "['Take Me Out to the Ballgame'] is a product of the tradition of wanting to go to a baseball game," she said. "The song isn't in and of itself the tradition. I love the game of baseball and want to pass the game on to as many people as possible. This allows more kids and families to go to the game and have fun, and that's the goal."